All of ESO’s observatories are based in Chile, but the organisation’s headquarters, and the newest exciting addition sits in Garching, a small city near Munich in Germany. This image shows a striking and unusual view of this new member of the ESO family — the ESO Supernova Planetarium & Visitor Centre. The ESO Supernova has its official inauguration event on 26 April and will open for the public on 28 April. At its heart, the Supernova is a truly state-of-the-art planetarium that will visualise and project accurate, awe-inspiring, and fully immersive views of the Universe for audiences to enjoy. The building also houses a cutting-edge astronomy centre and exhibition space. To make things even more appealing, attendance and all activities will be free throughout 2018! This image was taken by ESO Photo Ambassador Petr Horálek, reveals the curved arms of ESO headquarters reaching out toward the unique Supernova building, below a sky painted in beautiful, dusky oranges and pinks. 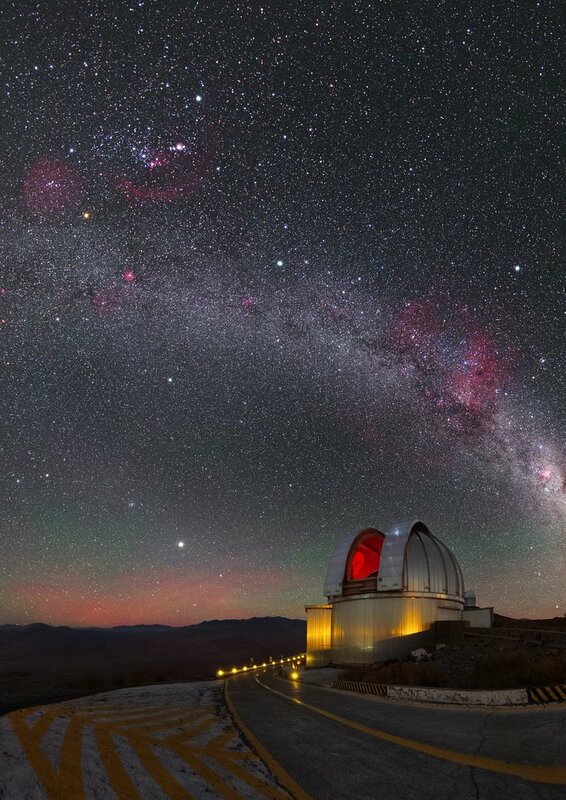 Our Photo Ambassadors make the very most of the dark skies over ESO’s observatories to provide stunning views of the cosmos, which we then share with the public via outreach activities such as our Pictures of the Week. 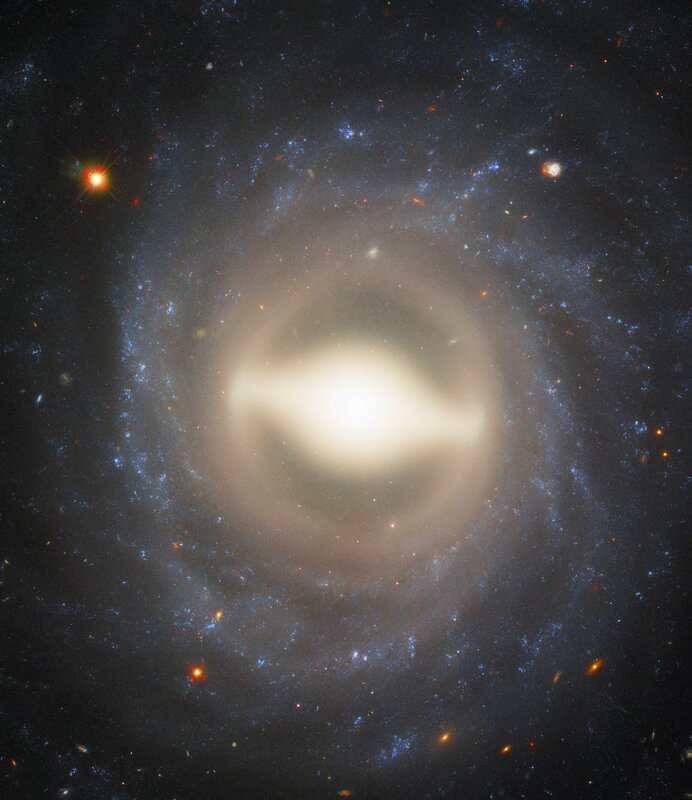 This enchanting spiral galaxy can be found in the constellation of Ursa Major (the Great Bear). Star-studded NGC 3972 lies about 65 million light-years away from the Earth, meaning that the light that we see now left it 65 million years ago, just when the dinosaurs became extinct. 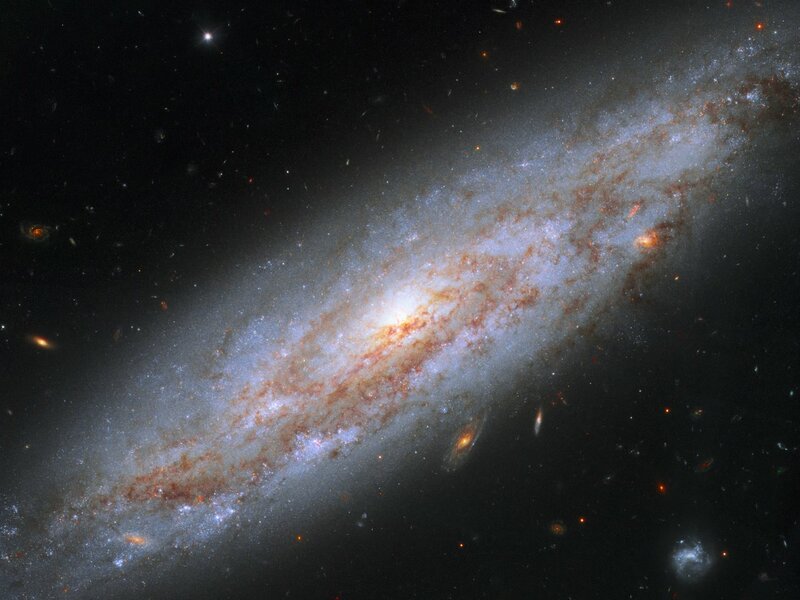 NGC 3972 has had its fair share of dramatic events. In 2011 astronomers observed the explosion of a type Ia supernova in the galaxy (not visible in this image). These dazzling objects all peak at the same brightness, and are brilliant enough to be seen over large distances. NGC 3972 also contains many pulsating stars called Cepheid variables. These stars change their brightness at a rate matched closely to their intrinsic luminosity, making them ideal cosmic lighthouses for measuring accurate distances to relatively nearby galaxies. Astronomers search for Cepheid variables in nearby galaxies which also contain a type Ia supernova so they can compare the true brightness of both types of stars. That brightness information is used to calibrate the luminosity of Type Ia supernovae in far-flung galaxies so that astronomers can calculate the galaxies' distances from Earth. Once astronomers know accurate distances to galaxies near and far, they can determine and refine the expansion rate of the Universe. This image was taken in 2015 with Hubble’s Wide Field Camera 3, as part of a project to improve the precision of the Hubble constant — a figure that describes the expansion rate of the Universe. Michael Vanhuysse. 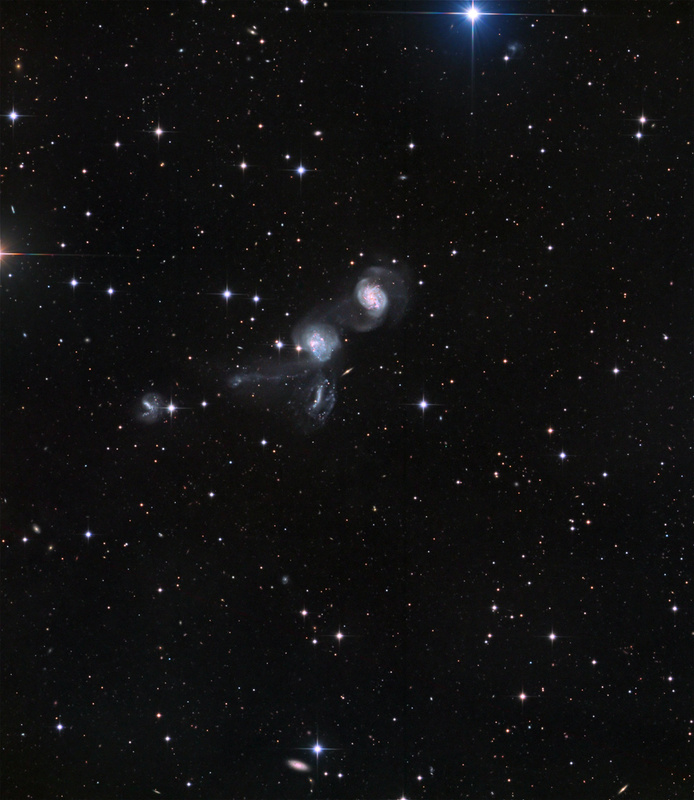 K2-2 on the left is a planetary nebula mimic. This planetary nebula was discovered by the Deep Sky Hunters member Dave Riddle in 2005. This planetary nebula was discovered by the Deep Sky Hunters member Dana Patchick in 2005. 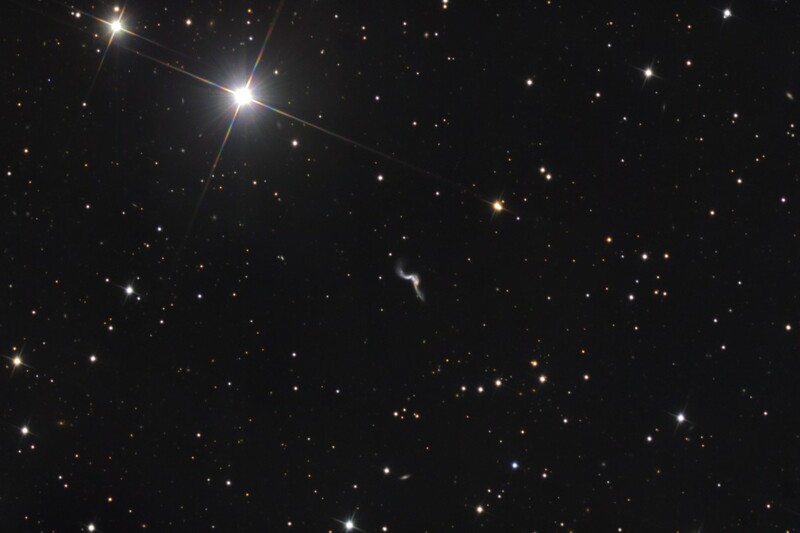 Otherwise catalogued as LBN 105-6, this is one of a few examples of a deep sky object other than an emission nebula found in the Sharpless catalogue of HII regions and is actually a high latitude dust cloud. A sweeping blanket of stars gazes serenely down over Cerro Paranal, Chile, as the rising Sun gently warms the horizon with splashes of red and yellow. Cerro Paranal is home to ESO’s Very Large Telescope (VLT) — and this striking panorama reveals the telescope in all its glory. All four of the VLT’s large 8.2-metre Unit Telescopes are visible along the left side of the image, lined up and ready to explore the Universe. Two smaller 1.8-metre Auxiliary Telescopes can be seen scattered across the right side of the frame; the VLT has four of these in total, all of which are movable along a grid of tracks, and can be rearranged as needed. In the distance, the 2.6-metre VLT Survey Telescope (VST) — the newest addition to Paranal — can be seen just beyond the rightmost Unit Telescope. Above and between the two leftmost Unit Telescopes, the mighty extent of our nearest neighbour, the Andromeda Galaxy, is visible as a bright smudge in the night sky. The photo was taken by ESO Photo Ambassador Alexandru Tudorică. This stunning image from Hubble shows the majestic galaxy NGC 1015, found nestled within the constellation of Cetus (The Whale) 118 million light-years from Earth. In this image, we see NGC 1015 face-on, with its beautifully symmetrical swirling arms and bright central bulge creating a scene akin to a sparkling Catherine wheel firework. NGC 1015 has a bright, fairly large centre and smooth, tightly wound spiral arms and a central “bar” of gas and stars. This shape leads NGC 1015 to be classified as a barred spiral galaxy — just like our home, the Milky Way. Bars are found in around two-thirds of all spiral galaxies, and the arms of this galaxy swirl outwards from a pale yellow ring encircling the bar itself. Scientists believe that any hungry black holes lurking at the centre of barred spirals funnel gas and energy from the outer arms into the core via these glowing bars, feeding the black hole, fueling star birth at the centre and building up the galaxy’s central bulge. In 2009, a Type Ia supernova named SN 2009ig was spotted in NGC 1015 — one of the bright dots to the upper right of the galaxy’s centre. These types of supernovae are extremely important: they are all caused by exploding white dwarfs which have companion stars, and always peak at the same brightness — 5 billion times brighter than the Sun. Knowing the true brightness of these events, and comparing this with their apparent brightness, gives astronomers a unique chance to measure distances in the Universe. This supernova remnant is also known as Simeis 147. This spectacular shot from ESO’s La Silla Observatory in Chile was captured by by ESO Photo Ambassador Yuri Beletsky, and reveals all manner of astronomical treats! The central plane of our galaxy stretches, slightly curved, across the frame, peppered with bright patches of gas and dark, weaving dust lanes. Although initially a little hard to see against the intricate cosmic backdrop, the constellation of Orion (The Hunter) can be seen to the top left of the frame. Multiple pink clouds, produced by the faint glow of ionised hydrogen gas, appear to extend beyond the band of the Milky Way, indicating the presence of hot, young new stars. One of these areas is Barnard's Loop, which encircles the famous Orion Nebula and can be seen curving around Orion’s Belt. The MPG/ESO 2.2-metre telescope sits beneath the colourful night sky, where it is currently involved in research chasing the aftermath of some of the most energetic explosions in the Universe — gamma-ray bursts. The telescope is also used to image the nearby cosmos with the attached Wide Field Imager (WFI). This idyllic scene, packed with glowing galaxies, has something truly remarkable at its core: an untouched relic of the ancient Universe. This relic can be seen in the large galaxy at the centre of the frame, a lenticular galaxy named NGC 1277. This galaxy is a member of the famous Perseus Cluster — one of the most massive objects in the known Universe, located some 220 million light-years from Earth. NGC 1277 has been dubbed a “relic of the early Universe” because all of its stars appear to have formed about 12 billion years ago. To put this in perspective, the Big Bang is thought to have happened 13.8 billion years ago. Teeming with billions of old, metal-rich stars, this galaxy is also home to many ancient globular clusters: spherical bundles of stars that orbit a galaxy like satellites. 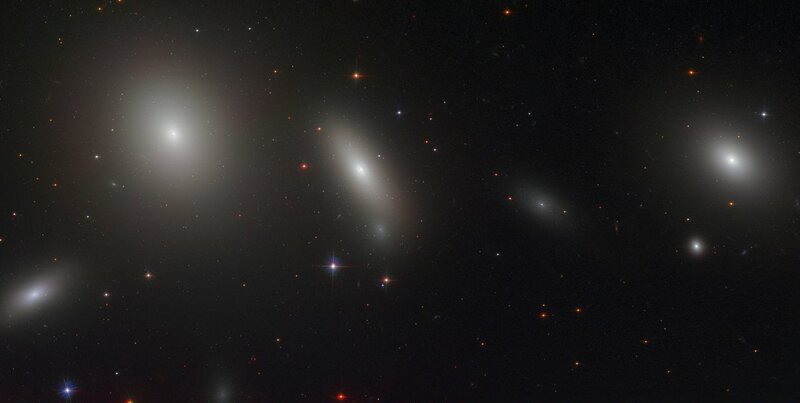 Uniquely, the globuar clusters of NGC 1277 are mostly red and metal-rich — very different to the blue, metal-poor clusters usually seen around similarly-sized galaxies. In astronomy, a metal is any element heavier than hydrogen and helium; these heavier elements are fused together in the hot cores of massive stars and scattered throughout the Universe when these stars explode as they die. In this way, a star’s metal content is related to its age: stars that form later contain greater amounts of metal-rich material, since previous generations of stars have enriched the cosmos from which they are born. Massive galaxies — and their globular clusters — are thought to form in two phases: first comes an early collapse accompanied by a giant burst of star formation, which forms red, metal-rich clusters, followed by a later accumulation of material, which brings in bluer, metal-poor material. The discovery of NGC 1277’s red clusters confirms that the galaxy is a genuine antique that bypassed this second phase, raising important questions for scientists on how galaxies form and evolve: a hotly debated topic in modern astronomy.